The A182 table set was introduced this year. 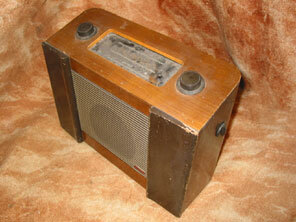 Like the A170 of 1950 with its plastic grilles Murphy are again experimenting with the speaker cover material. On the A182 a kind of plastic imitation cloth material has been used. The material seems deliberately made to look like plastic rather than an imitation of cloth, and as a result looks a bit “cheap”. Fifty years ago when nylons and plastics were a novelty though this may have been seen as luxurious. I’d guess not though as the material was not used again for later receivers. Also notable is the use for the first time of the Murphy badge against the red background placed on the speaker grille. This is the first time Murphy have used a distinct badge (rather than placing their name on the tuning dial, for instance). Valve line-up is 6C9, 6F15, 6LD20, 6P25, Metal Rectifier. You might think the picture of the inside of the set is upside down, but that is not the case. 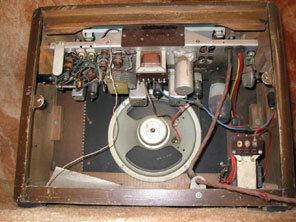 For this receiver Murphy have situated the chassis at the top of the cabinet, with all the valves "hanging" downwards. Fortunately the tension of the valve base socket pins appears to have remained strong over the years!